The DRI Sleeper® Eclipse is a premium quality wireless bedwetting alarm designed to help your child experience the joy of a dry night's sleep. Our pack includes a free poster to encourage and motivate your kid while tracking progress towards dry nights. 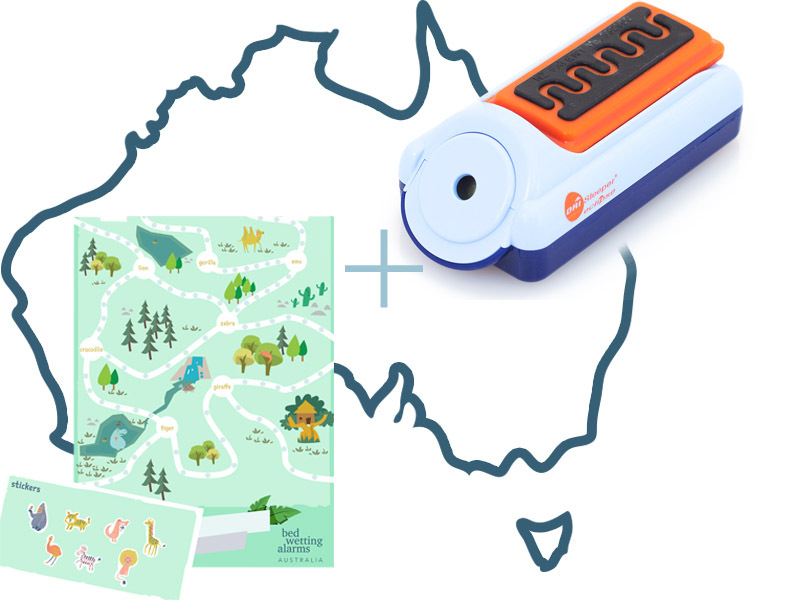 All of our Bed Wetting Alarms come with complete Australian Support. World Patent Pending Urosensor™ technology – it’s the only non-metal urine sensor ever. So there’s no corrosion by urine, no skin irritation, and it's easy to clean for instant reuse. The Urosensor™ docks on the DRI Sleeper® alarm unit when not in use and engages battery saving technology. The special electronics make the wireless Urosensor™ the thinnest of them all. No wires between alarm and sensor. High volume with a tamper-proof volume adjustment. Designed like a small 'space rocket' for child appeal. The Urosensor™ can transmit to more than one DRI Sleeper® alarm unit, and so there can be another receiver in a parent's or carer's room. Big detecting area to detect the urine. 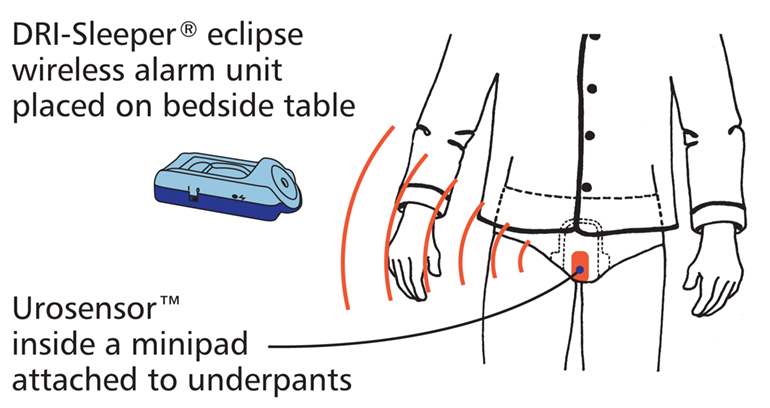 Put the Urosensor™ in the underwear (inside a minipad is best - click for alternatives). Place the DRI Sleeper® alarm unit on a table away from the bed so your child has to wake completely to turn it off. Switch on the DRI Sleeper® alarm and that's all. When the Urosensor™ is wet with the first drops of urine, it sends a radio signal to the extra loud DRI Sleeper® alarm unit and triggers the alarm – treatment has begun. The Dri Sleeper Eclipse Bed Wetting Alarm works on the principal of behavioural conditioning - training the brain to respond to signals from the bladder to avoid the jarring alarm. We typically start seeing results within the first few weeks, however, full treatment can take 6-8 weeks before curing your child of bed wetting. We have been providing advice and assistance to Australian families for over 30 years and back our Bed Wetting Alarms with unrivalled customer service and ongoing support. Please read through all of our Bed Wetting Alarm Tips or feel free to contact Jack with any questions. Dri Sleeper Bedwetting Alarms have a 90% success rate according to an independently audited study. With over 30 years experience assisting in bedwetting, our local team are there to help your child achieve dry nights and answer any of your questions. Typically, your child will achieve dry nights in 6-8 weeks using the Dri Sleeper Bedwetting Alarm. Plus, we're here to help through the whole process. Made of conductive plastic, Dri Sleepers Urosensors are gentle to even the most sensitive skin. We purchased the Eclipse DRI Sleeper when my son was 11 years old. Up until then he would wet the bed most nights.